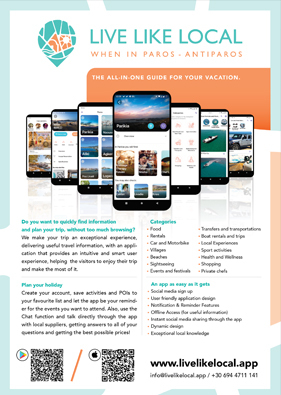 Special Offer: Please check our special offers when you add your arrival and departure dates, the number of the guests (adults and children) and click the Calculate button. Miracle Villas is a majestic hilltop residential construction, consisted of 4 independent and autonomous Villas which can accommodate 6-8 persons each. 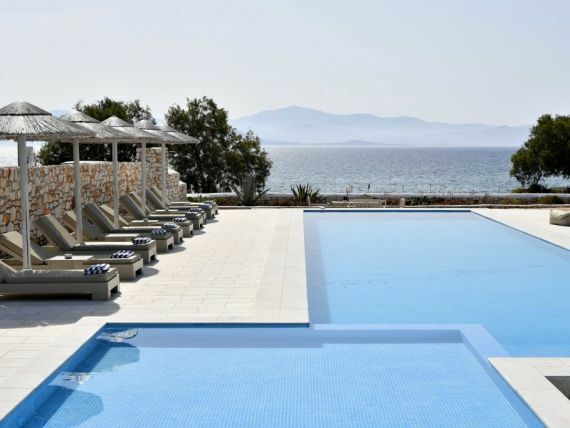 The villas have elegant, neoclassical design and they are situated only 5 minutes away from the port of Parikia and 7 minutes from the airport. The resort has been built in a natural area, on a 7400m² plot, with lush green gardens filled with pine and olive trees, herbs and flowers. 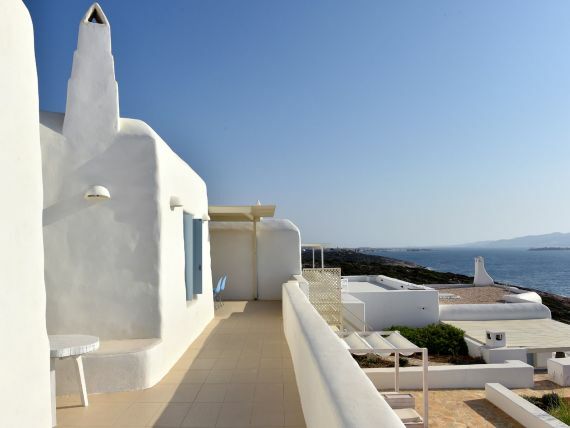 Miracle Villas is very close to secluded beaches, at a location of unique natural beauty, with wonderful light and beautiful seascapes. 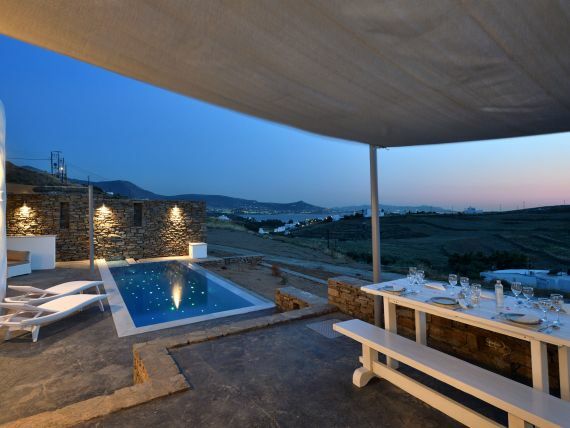 The brand new resort has outstanding, uninterrupted panoramic views of the Aegean Sea and the Bay. 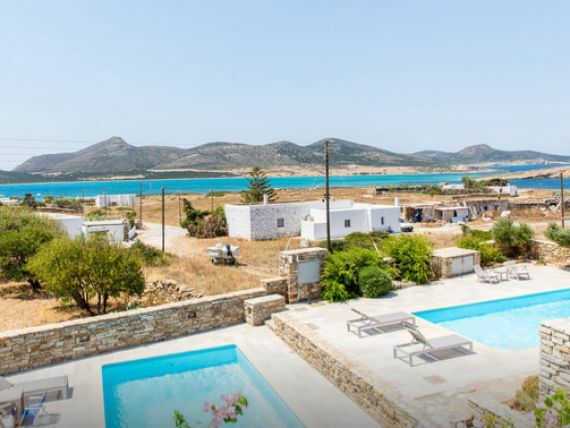 This unique location with a breath-taking view of the sea surrounded by the beautiful natural landscape of Paros will give you the sense of freedom. You might even believe for a few seconds that you're floating above the hustle and bustle of the island. A special experience on this resort is sunset enjoyed from the terrace. 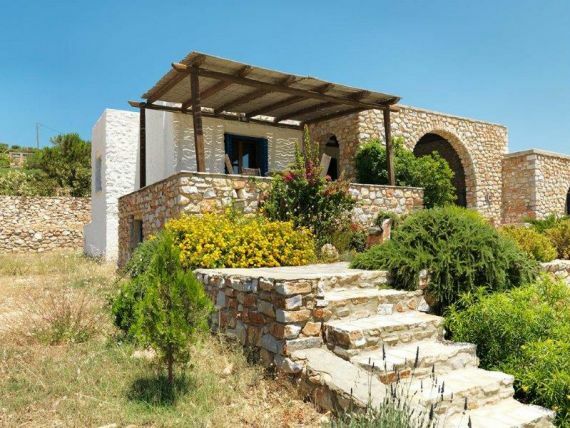 In short: An oasis of tranquility with easy access to the key places on the island. 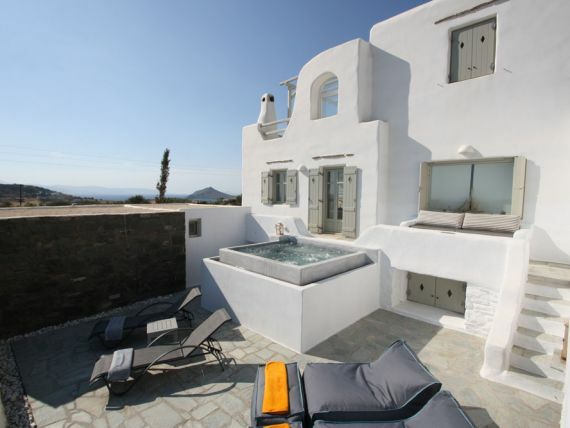 This lovely 3 br villa is designed to harmonize with the environment and it is furnished in the typical Cycladic Island style. Entering the ground floor of the villa, you walk into a hallway that leads to the living room, dining area and kitchen. The very tasteful, fully equipped fitted kitchen has all the technical and creative amenities that a "chef" wants. 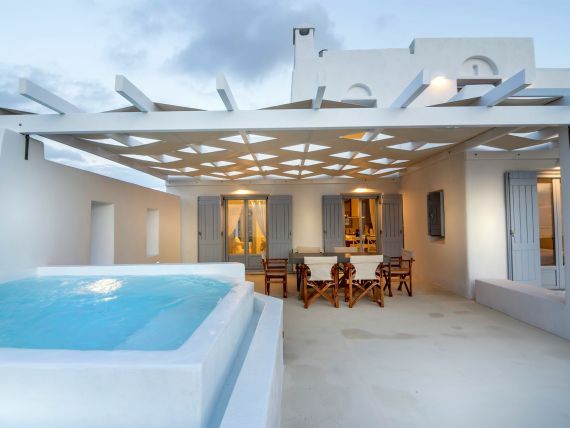 From the dining area, you walk through pretty natural stone arcades to reach the spacious living area with its fireplace and a large window with a magnificent view of the Aegean and of Parikia. The floors throughout the ground floor are covered in sheets of high-quality Naxos marble. 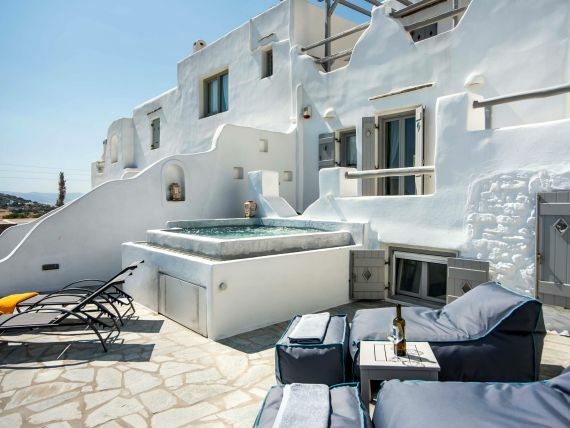 On the lower floor, there are 3 sunny bedrooms, each with its own lavish bathroom built in typical Cycladic style. All of the bedrooms have access to the outdoors and have mahoni wood parquet floors. All of the rooms have air conditioning and they are also heated with a central (oil) heating in case you visit us during winter time. At the outdoor, we provide a stunning communal terrace with an outdoor common pool (12x6 m) with a jet stream and sunbathing deck equipped with lounge chairs and garden furniture, shower house, BBQ area, outdoor parking and storage. 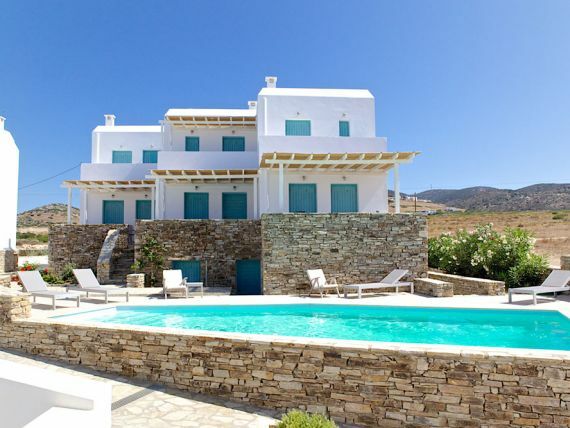 - It is located 4 km from capital of Paros, Parikia and 3 km from the nice beach of Agia Irini and Parasporos. 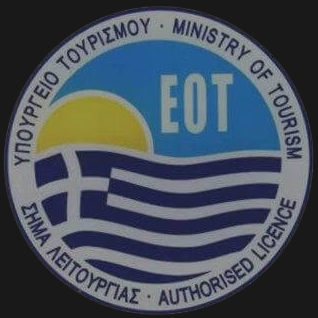 - Shopping-Dining: 5 km (Parikia with restaurants, mini market, pharmacy, café, bars etc). "; infoWin.setContent(katallima_info); hideAllInfoWindows(map); infoWin.open(map, marker); //jQuery('.gm-style-iw').parent('div').prev('div').css('background-color', '#000'); //$('.gm-style div div div div div').children().eq(3).css('background-color', '#000'); //alert ( $('.gm-style div div div div div').children().eq(3).attr('style') ); }) return marker; }); //------------------------------------------	var katallima_photo_main = "1DSC_9044.JPG"; if (katallima_photo_main != '') katallima_photo_main = 'paros_uploads/'+katallima_photo_main; else katallima_photo_main = 'img/no-photo.png';	var myLatlng = new google.maps.LatLng(37.061558,25.126912);	var contentString = "